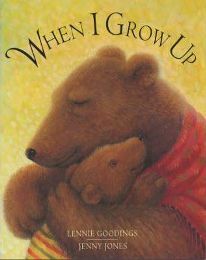 I think that the picture on the front of ‘When I Grow Up’ really sums up what this delightful picture story book is all about! It shows a Mummy Bear and her son giving each other a great big hug. You just know that this is going to be the sort of warm humorous book that children will love. Zachary is a little bear living with his mum. There are lots of things they have in common such as having the same colour fur and eyes, liking hugs and chocolate ice cream with honey on top, and feeling incredibly tired in the morning! Finally, Zachary’s mum suggests that he might grow up and have children of his own to which Zachary agrees and then decides that he won’t then live with his mum BUT he will live next door! ‘Will you let me lick the bowl?’ asks Mum. I like this because it reminds me of those funny little conversations I have with my two daughters every day! I also love this book because it is so full of possibilities for little children. It is basically saying that when you grow up you can be anything that you wish and that is so exciting! This can then prompt discussions with your own child about what they would like to be when they grow up too. This is an extremely well written story and to go with it there are lots of lovely illustrations. On each page there is so much to talk about in the pictures. It is written by Lennie Goodings, illustrated by Jenny Jones and published by Macmillan children’s books. I am sitting here looking at our copy as I write this and looking at how well worn the pages are which must be the best recommendation there can be for a book! I know my daughters would agree as I think they choose this book to read more than any other! No Comments on "When I Grow Up"